In the Kriti Yuga, all the saints assembled together to conduct a Yagna for the goodness of the Universe. Then came the famous Rishi (saint) Narada, at the bank of the Ganga, asked the sages (saints) whom did they want to give the fruits of the Yagna among the Trio (Lord Brahma, Lord Vishnu and Lord Shiva). A great debate started and it was agreed that Sage Bhrigu undertake the difficult task of finding out who is the most appropriate for the fruits of the Yagna among the Trio. Maharishi Bhrigu went to Shiva-loka and Brahma-loka and decided not to select Lord Shiva or Lord Brahma as the greatest leader of all because they did not give him an appropriate welcome. Rishi Bhrigu then went to Vaikunth-loka and noticed that Lord Vishnu ignored him and continued talking to his wife Mahalakshmi. Maharishi Bhrigu became angry and he his Vishnu's chest, whit his foot. Mahavhishnu asked for forgiveness and touched the Rishi's feet. Goddess Lakshmi felt insulted since Maharishi Bhrigu had hit Vishnu on his chest where Mahalakshmi lives. Seeing no anger from her Lord Vishnu, She left Vaikunth-loka for earth. Rishi Bhrigu was touched by Lord Vishnu's humility and decided to give the fruits of the Yagna to him. In the absence of Maha Lakshmi, Vishnu found Vaikuntha uninteresting. He also left Vaikuntha and came to the Seshachal hill and started penance in a hermitary. Lord Krishna's mother Yashoda in her past life was Vakula Devi. She lived on the Seshachal hills as a devotee of the Lord. She looked after Lord Vishnu as a Mother. King Akash had no children, so he performed a yagna and was suggested to plough the field used for the Yagna. While ploughing the field, he found a child lying in a lotus having thousand petals. Kind named her Padmavati who was the incarnation of Mother Earth. Padmavati used to walk amongst the hills of Seshachal and it was there that Padmavati and Vishnu saw each other. They fell in love. Maharishi Shuk went king Akash as Vishnu's messenger and asked for Padmavati's hand in marriage for Vishnu. King Akash agreed for the marriage of Vishnu and Padmavati (known as Bhudevi). He already had Mother Lakshmi as a wife. 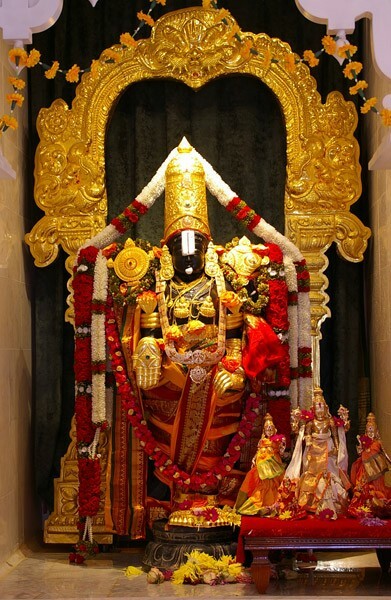 In our Temple, you can see Mothers Lakshmi and Bhudevei on the chest of Lord Balaji. Even since then Lord Vishnu stands on the Seshachal Hills as Bhagwan Balaji and gives boons to devotees. We can please Balaji by offering our hair, laddu, walth and by fasting on Saturdays. The reason Mahavishnu is referred as Balaji is because he is pleased by the offering of one's hair.